Everyone should have a rainy day cash fund. Not an emergency fund. Although, you should have one of those as well. No, a rainy day cash fund should be exactly that. Cash. Easily accessible, and easily spendable. Ahhh! Did he just say “easily spendable”? Yes. I did. Why would I say something like that? Common advice is that you should put your money in an account where it isn’t easily spendable. Especially your emergency fund. You don’t want any everyday “emergency” to drain your emergency fund dry. It’s for real emergencies. An engine in a car that stops working and needs repairs. Although, some would argue that’s what a car repair fund is for. Those quasi “emergencies” aren’t what a rainy day cash fund is for either. Sorry. I’m sure some of you wanted me to tell you that it was smart to have a little stash of cash that you could hide away for those tools you really, really, “needed”. But, it’s not for that. 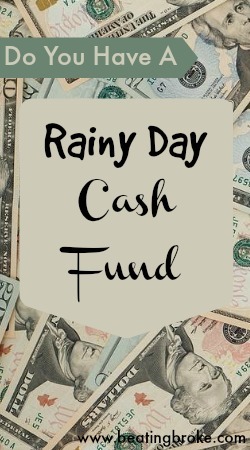 What is a Rainy Day Cash Fund for? It’s still for real emergencies. Just not the kind that your emergency fund is for. Consider. A major power outage happens. You really, really, need a tank of propane to light up to heat your house until the power comes back on. You get to the gas station, or wherever you buy the propane from, except they don’t have any power either. Their credit card reader isn’t going to take your debit card. In fact, they’re writing down transactions and calculating change with a calculator. Without power, it’s a cash only transaction. If you don’t have any cash, you’re headed back to your cold house without any propane to heat the house with. Taken to an even farther extreme (a Prepper extreme, you might say) you could find yourself in a situation where regional or national economies fail entirely. Of course, having cash in that regional or national currency probably isn’t going to do you much good. That’s why you hear all the stories about preppers stockpiling gold and silver. They believe that in a situation of economic collapse, everyone will revert back to gold and silver for bartering with each other. In the show, Revolution, which is about the total loss of the power grid and the destabilization that follows, you’ll often see people paying each other in diamonds. I’m not saying that you’ve got to have a couple of coffee cans full of gold coins out under the tree in the backyard. For most of the situations you’ll find yourself in, a little of ol’ greenback will do you just fine. 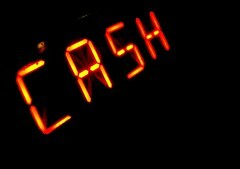 How Much Cash in a Rainy Day Cash Fund? Thousands. Then, please send me a note with your address, and the exact location where the cash is stored. I’m only kidding. Much like anything else, your rainy day cash fund is a bit variable. It will depend on what you can afford to just put away in cash. Although, for most, the rainy day cash fund is well within budgetary limits. Really, what we’re talking about is having enough cash available that you can afford a tank of gas, or a loaf of bread should you be unable to use a debit card. In almost every case, something like $100 should be plenty. Where to Put the Rainy Day Cash Fund? Tape the bills lightly (you don’t want to rip them taking them off) to the back of a framed picture in your house. Most people won’t look there, and you’ve only got to take the picture off the wall to reach them. Just don’t forget they’re there if you decide you don’t want the picture anymore. Under your mattress. Yes, really. It’s an old joke, but it’s also a convenient place that’s easily reachable and that most people aren’t going to casually look in if they’re being nosy. In a book. Pick your favorite book, and your favorite page and place the bills in the books there. Again, easily reachable, and less likely to be found. Just make sure that if you ever decide that you don’t need that book around, that you take the money out first. In the freezer. This is another old one. Throw the bills into an envelope and place it at the back of the freezer. Easy enough to get to if you really, really need it, but not so easy that guests (welcome or not) will easily find it. Behind the furnace. Put the bills in an envelope, along with a decently strong kitchen magnet. Attach the envelope to the back of your furnace or any metal surfaced appliance so long as they won’t be exposed to flame or extreme heat. Easily accessible, but who’s gonna go poking around your furnace (or the back of your fridge) looking for loot? That’s just a few ideas. What it really boils down to is putting a little cash away for a rainy day when you need it, and placing it somewhere where it won’t easily be found by prying eyes. What do you think? Should you have a little rainy day cash fund? How much would you put in it? Where are some other good places to put the cash?